Joe Holiday is an award winning magician who has been working in the entertainment industry for over twenty years. Making hundreds of performances yearly for thousands of audiences all over the world. From Singapore and Seoul South Korea to the casino’s of his hometown in Atlantic City, where Joe has been a featured performer at both the Tropicana and Trump Taj Mahal Casino Hotels. Joe has appeared on international television and was the featured guest star in Harary’s multi-million dollar Illusion show “Mega Magic”. The summer long run was seen by over a million people throughout Asia. Headlining on major cruise ships and appearing for corporate companies such as, KPMG, Bradley Caldwell Inc., The Trump Organization and Optaros Ecommerce solutions company. STROLLING MAGIC- Strolling magic presents some of the most stunning, visual and exciting magic you can imagine. Bruce transforms ordinary cocktail receptions, hospitality suites, banquets, corporate events and other gatherings into absolutely unforgettable experiences for your guests. 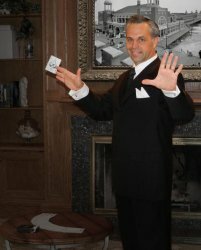 Using sleight-of-hand he performs strolling magic at your event by mingling with your guests as he performs short, intimate, close-up magic for individuals and small groups of people. This type of performance is a highly interactive, with each person able to participate. 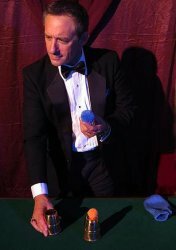 FORMAL CLOSE UP SHOW – Close up, sleight-of-hand, magic can also be performed in a more formal setting where the audience is seated around a table while they watch Bruce perform. Close up magic is perfect for audiences of 40, or fewer, and is the ideal entertainment venue for small private events, dinner parties, and smaller corporate events. STAGE SHOW – Performing on a larger scale to a seated audience of 40 or more using larger props such as silks, ropes, giant playing cards and more, his dynamic show features audience participation, elegant magic and humor and is the perfect act for meetings, conferences or award dinners. Bruce presents an amazing performance filled with magic, music, and audience participation. His stage show generally run 45-60 minutes but can be designed shorter to meet your time requirements. COMBINATION SHOW – Often, clients will have him perform an hour of intimate strolling or close up magic during the reception or banquet portion of the event, and end the evening with a mesmerizing stage show to the delight of your guests. Bruce loves to work with each client on a performance concept that will make your special event successful and spectacular!